The Connecticut Certificate of Formation New Religious Corporation or Religious Society | Form CICR-1-1.0 must be filed with the Connecticut Secretary of State when a religious entity wishes to incorporate in this state. 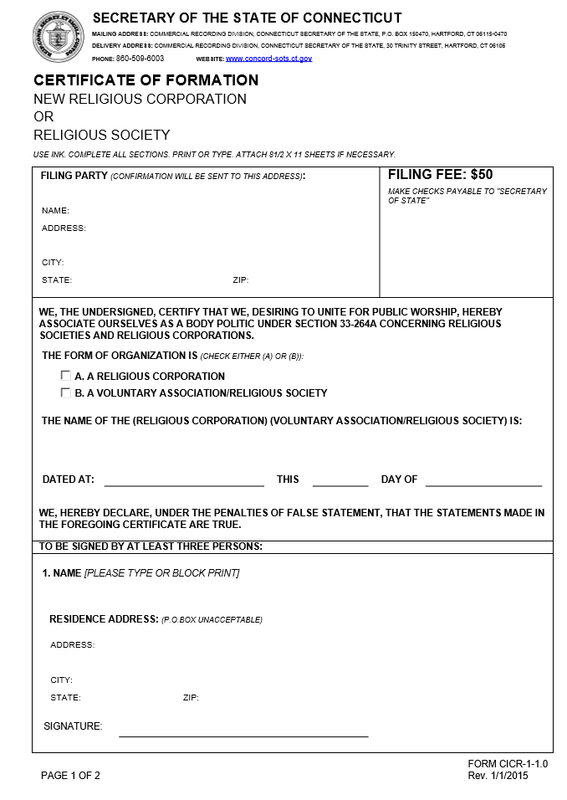 It is important to note that while many religious corporations enjoy a tax exempt status, satisfying the Connecticut Certificate of Formation New Religious Corporation or Religious Society | Form CICR-1-1.0 does not satisfy the documents needed by such entities as the Internal Revenue Service. Any other governing entity will have its own requirements and Incorporators should make sure they are fully aware of their responsibilities in creating this entity. If there are any unclear areas of this process, Incorporatorsshould seek consultation with an appropriate attorney. The Connecticut Secretary of State Recording Division will accept only anoriginal fully completed Certificate of Formation along with any required documentation and the full payment of the State Filing Fee ($50.00, check made payable to “Secretary of State”) by mail or in person. You may mail the Connecticut Certificate of Formation New Religious Corporation or Religious Society to Commercial Recording Division, Connecticut Secretary of the State, P.O. Box 150470, Hartford, CT 06115-0470 or submit in person at Commercial Recording Division, Connecticut Secretary of the State, 30 Trinity Street, Hartford, CT 06115-0470. It should be noted that by default the Connecticut Secretary of State will email confirmation and other information regarding your submittal and is currently working on accepting electronic filings in the future. Step 1 - The first section, “Filing Party,” will require the full Name, Address, City, State, and Zip Code of the individual who is filing these documents with the Connecticut Secretary of State. Step 3 - After defining the type of entity being formed, report the full name of the religious corporation this document concerns itself beneath the statement beginning with “The Name of the (Religious Corporation).” Then report the Calendar Day, Month, and Year of this filing. 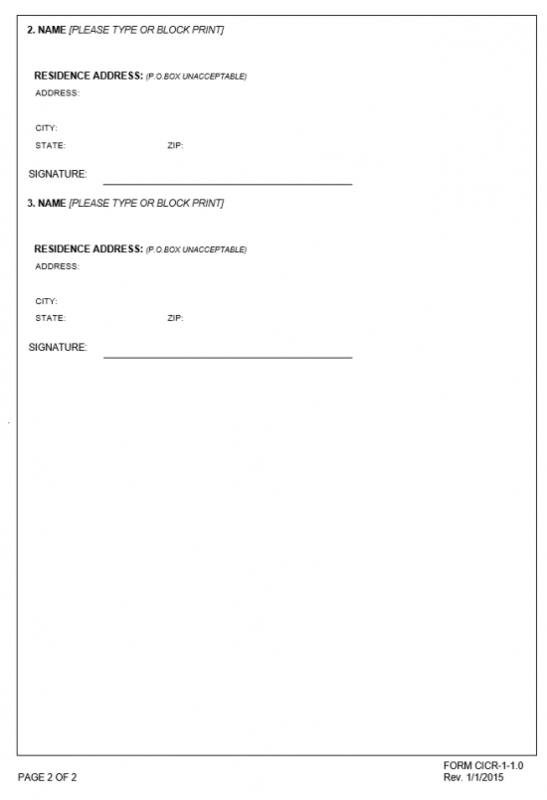 Step 4 - This document must be signed by three Incorporators. Each will have a separate section where one may print his/her Name, enter his/her Residence Address (Street Address, City, State, and Zip Code), then sign his/her name of the “Signature” line.